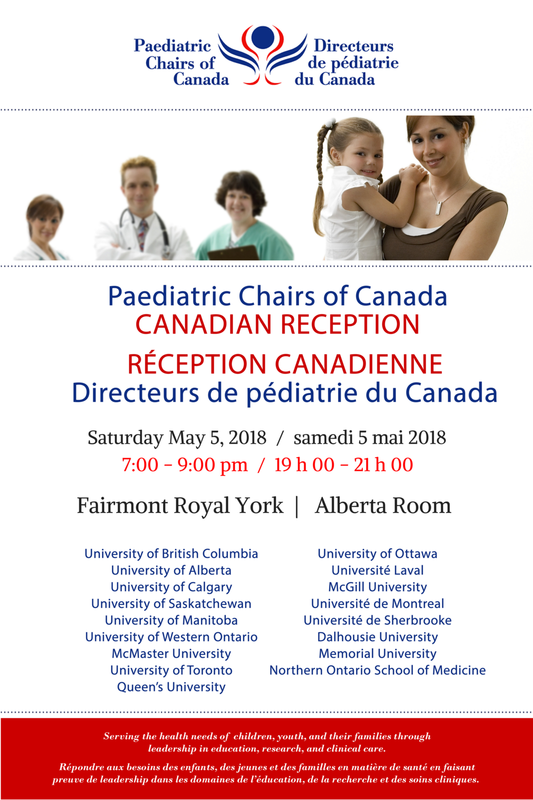 June 29, 2018 - The Paediatric Chairs of Canada (PCC) and the Canadian Association of Paediatric Health Centres (CAPHC) join in congratulating and welcoming you to your new role as the President of the Canadian Institute of Health Research (CIHR). 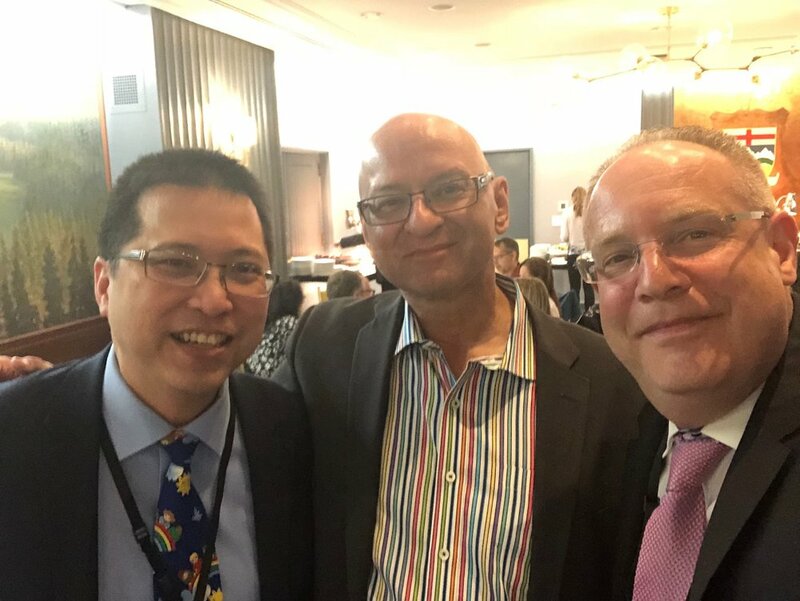 Dr. Kevin Chan, Dr. Michael Rieder and Dr. Ronni Cohn enjoy the PCC Canadian Reception at the PAS Conference in Toronto. 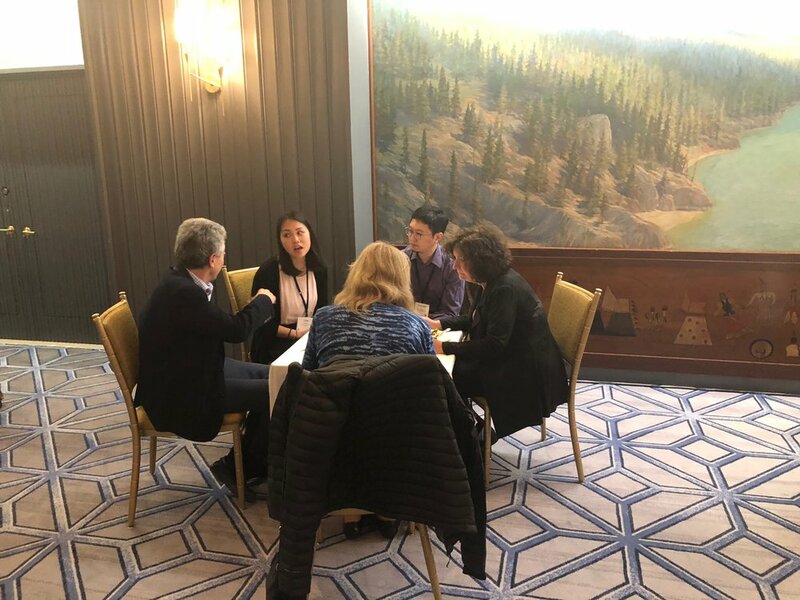 Networking and socializing with Canadian colleagues. Dr. Michael Rieder (University of Western Ontario on behalf of Dr. Terry Klassen, University of Manitoba) and Dr. Ming-Ka Chan (Clinician Educator - University of Manitoba). 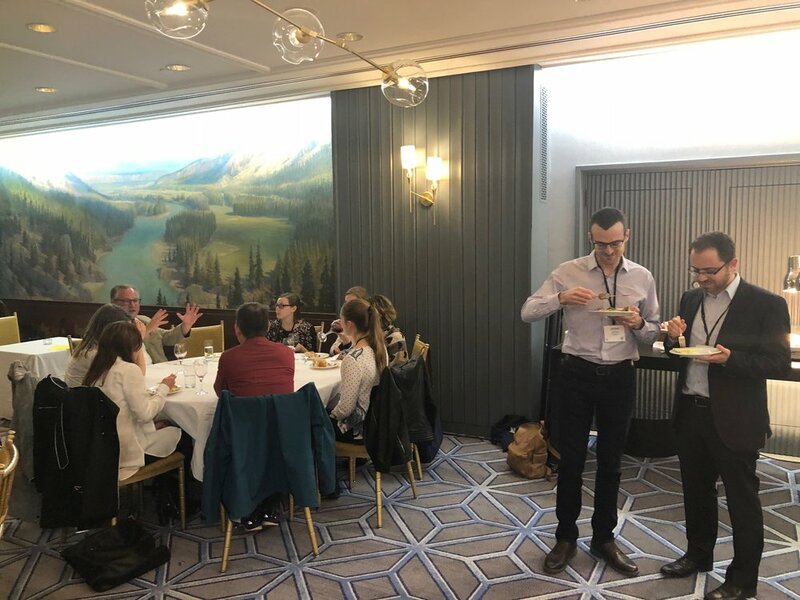 On October 20, 2017 the Paediatric Chairs of Canada were honoured to welcome our 2017 Paediatric Academic Leadership Award winners to Montréal to a reception and dinner to present the awards, and celebrate their achievements with their colleagues and families. Dr. Jeremy Friedman (University of Toronto) is PCC’s recipient of the 2017 Paediatric Academic Leadership - Clinician Practitioner Award. Dr. Ming-Ka Chan (University of Manitoba) is PCC’s recipient of the 2017 Paediatric Academic Leadership - Clinician Educator Award. Congratulations to all of our 2017 PCC Award Winners! The Paediatric Chairs of Canada are proud to announce the recipients of the 2017 Paediatric Academic Leadership Awards! Dr. Alexander MacKenzie (University of Ottawa) is PCC’s recipient of the 2017 Paediatric Academic Leadership - Clinician Investigator Award. Dr. Friedman, Dr. Chan and Dr. MacKenzie will be honoured at the Annual Awards Reception and Dinner that takes place alongside the PCC Fall Business Meeting in October. Click here to read more about this years winners. It is with great pleasure that we introduce Emily Gruenwoldt as the new President & CEO, Canadian Association of Paediatric Health Centres, and Executive Director, Paediatric Chairs of Canada, effective January 30, 2017. Emily joins CAPHC & PCC following the retirement of Elaine Orrbine, who provided over 15 years of exemplary services to the organizations and to children and families across Canada. We’ve had many opportunities to wish Elaine the very best in her well-earned retirement. Emily comes to CAPHC and PCC with a wealth of leadership experience in health care and association management. Most recently, Emily has served as Director, Professional Affairs and Director, Physician Learning and Development, at the Canadian Medical Association, where she has led strategic initiatives to advance the medical profession and to increase and support leadership capability and capacity – among other strategic and operational responsibilities. Emily has also worked previously with the Association of Canadian Academic Healthcare Organizations and the Canadian Nurses Association. Emily also brings significant health care governance experience having served as a board member of The Ottawa Hospital and as a current member of the Arnprior Regional Health board. The joint CAPHC/PCC Selection Committee was particularly impressed with Emily’s intelligence, strategic vision, and communications skills, as well as her clear passion for the health of Canada’s children and youth. Please share this message throughout your organizations and networks, and join us in welcoming Emily to the CAPHC/PCC family. Dr. Michael Shevell re-appointed to second term as Chair of Pediatrics at McGill University, Faculty of Medicine. Dr. Ciarán Duffy re-appointed to second term as Chair of Pediatrics at University of Ottawa, Faculty of Medicine. 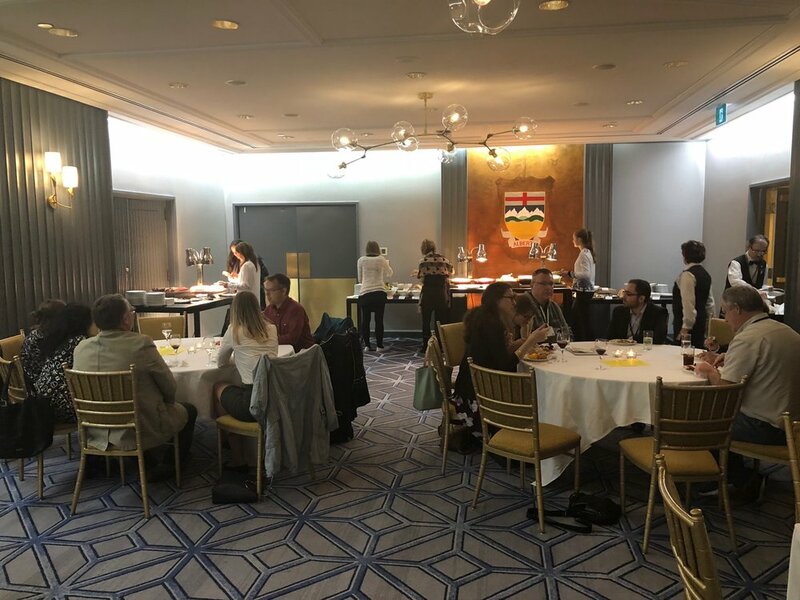 In June of 2015, the Paediatric Chairs of Canada (PCC) held a special PCC Alumni Event at the beautiful Peter Gilgan Centre for Research and Learning in Toronto, in association with the CPS Conference and PCC Business Meetings. 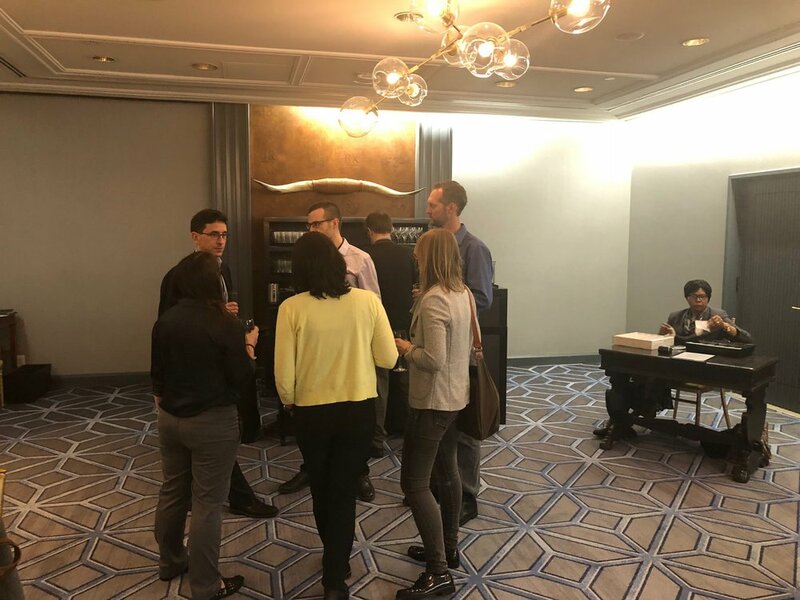 The purpose of the event was to reconnect, share valuable insights and past-Chairs perspectives on "life after being a Department Chair". Theme Professor Binna Kandola and the Unconscious bias in decision making. Theme What should we as leaders in child health in Canada be focusing on in PCC's strategic priorities over the next five years? Theme Maximizing Impact of Strategic Planning: Sharing nationally to enhance local success! Theme Can we increase productivity through financial incentives? What's working? What else can we do? Theme Effective communications when dealing with government. How do we get our key messages across? Theme Leading Change: Who would want to be led by you?